The 1948 Cadillac was a completely new design, foreshadowing what most cars in the 1950s would look like. One look at its sleek styling, it is easy to see why it has stood the test of time. Today the 1948 Cadillac still looks as breathtaking as it did 60 years ago when it was first released. The front end would set the standard for 1950s cars, with a more boxy style when compared to the other cars of the late 1930s and 1940s. Gone were the massive humps and bumps, they were still there on the hood, trunk, and rear quarter panels but smoothed out to give the car a more squared shape overall. These reasons alone would put the 1948 Cadillac on our list, however it’s the rear design that all automakers would copy and some to excess for the 15 years after its release. And we’re not talking about the trunk or bumper design, which also was nicely styled. The design innovation on this car that Cadillac would forever be associated, was the first ever rear tailfins. They were small by late 1950s standards but when looking at the 1948 Cadillac you can’t miss seeing them. Harley Earl who was head of GM styling at the time was responsible for the tailfins. Earl’s inspiration was Lockheed’s P38 Lighting fighter plane, which was one of the most elegant planes to fly during WWII. The tailfins were nothing short of a blockbuster hit, within a few years every American automaker had them on their cars. The tailfin pinnacle was the 1959 model year when Cadillac released the largest tailfins ever seen on a car. The Imperial was Chrysler’s luxury flagship, in fact Imperial was so special to Chrysler it was its own division until the 1970s. Though luxury cars in the 1940s through the mid 1950s were big in size they were not mammoth. This all ended when the 1957 Imperial was released it was low, long, and heavy. Its 226.3" length by 1957 standards was very long. By the late 1960s and early 1970s this large Imperial size length would become the norm for luxury and wannabe luxury cars. Though the 1957 Imperial did have a large set of tail fins, it will be most remembered for its long and low styling. This new long and low style when released on the 1957 Imperial was a big hit with buyers and admirers alike. The competition was caught by surprise, even Cadillac was caught napping, Cadillac did not release its long and low body style until 1959. The long and low styling would prove to be very popular in the luxury car segment until downsizing occurred in the late 1970s. Lincoln by the 1950s had lost some of the luster it once had. It played second fiddle to the Cadillac. Lincoln tried imitating Cadillac and Imperial, in the 1950s. Though the Lincolns of the 1950s were nice cars they just could not compete with Cadillac – the luxury sales leader. All the up-and-comers wanted Cadillacs, after-all Elvis drove Cadillacs not Lincolns. In the 1950s anyone who wanted to be somebody drove a Cadillac. Lincoln realizing it needed to set a new styling course decided on a strategy that was to be a real gamble. Lincoln cast rationality to the wind and released the 1961 Lincoln Continental, which was shorter than the Lincolns of previous years but still was long and low. There were no tailfins, which back in the day was heresy. By comparison Lincoln’s competition in 1961 still had tailfins that pointed to the sky. Chrome was well apportioned but not over done in the 1961 Lincoln. The car was a simple more boxy design but yet it was stylish. Chic is the best word to describe the 1961 Continental. The car truly lived up to its name since it was a continental car that many from all over the world admired. Lincoln seemed to have no boundaries with this car, they even made standard – rear suicide doors and an available convertible model which for 1961 was unheard of in a 4-door car. A stretched convertible version of this car became the U.S. Presidential Limousine, which traveled the world with President Kennedy. Unfortunately this would also be the same car (with a 1962 Continental facelift) that JFK was assassinated in during a motorcade through Dallas in November of 1963. Even 47 years after its release the car still has a modern beautiful silhouette when compared to most luxury cars. Lincoln with the 1961 Continental took the long and low styling of the 1957 Imperial and modernized it, within a few years all of Lincoln’s competitors copied its simple boxy style sans tailfins. The 1961 Lincoln Continental was the first modern luxury 4-door sedan. Though there had been 2-door luxury cars for many years before 1967, they all had been the 2-door versions of 4-door cars. There had also been the 2-door 1958 Ford (2+2) Thunderbird, 1962 Pontiac Grand Prix, 1963 Buick Riviera, and 1966 Oldsmobile Toronado but these cars were sporty 2-door cars with some luxury appointments but they were not considered true luxury cars. Cadillac took the plunge for the 1967 model year and released the Eldorado, which was the first true 2-door luxury car that did not share its body style with any other 4-door Cadillac. The 1967 Cadillac Eldorado provided the ultimate in luxury and the styling was the sportiest of any luxury car before it. It had a very elegant and classy body style. In fact this style was a personal favorite of Frank Sinatra. The front end with its hidden retractable headlamps gave the car a futuristic look. The car’s rear styling was also innovative yet very sporty. Where the 1967 Eldorado was a design trendsetter was with its very long hood and short rear deck lid styling. This styling would become a popular design copied by the competition. When Lincoln released its own version of the Eldorado – the 1968 Lincoln Continental Mark III, it had the Eldorado’s long hood and short rear deck lid styling. Even though the Eldorado went through several body changes and later a downsizing the long hood and short rear deck lid styling lasted until the 1985 Eldorado production ended. Many 2-door cars from the late 1960s, 1970s, 1980s, and 1990s had this long hood and short deck lid styling. In the late 1990s this styling was retired for good when the Ford Thunderbird (2+2) and Mercury Cougar were cancelled. The seventies were tough on luxury cars. In the begging of the 1970s luxury cars were big, powerful, and full of options. When the 1970s ended and 1980 rolled in, big luxury cars still had lots of luxury options but were the size of the old medium size cars and they were powered by small to medium displacement V8s. Cadillac was smart enough to see this coming. When Cadillac still had a full lineup of massive cars with large displacement gas guzzling V8s in the mid 1970s they released a smaller Cadillac called the Seville. The 1976 Cadillac Seville was a big gamble for Cadillac especially considering it was to be their most expensive car for 1976. Cadillac was probably noticing that at country clubs smaller luxury cars such as Mercedes and BMW were starting to appear and the Seville was their answer to this new competition. 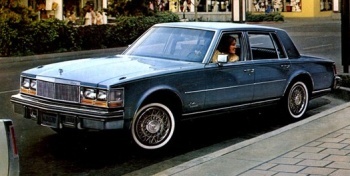 Still nobody knew how the luxury buying public was going to react to a small Cadillac, built on a Chevy Nova platform. This platform would have been considered small in the 1960s, by the early 1980s it would be a mid-size platform. Cadillac gave the car very elegant body panels making it one of the best looking sedans available in the US back in 1976. Nothing could touch the looks, luxury, and general appeal of the 1976 Cadillac Seville. Even with its high price tag the Seville was a mega sales success. The Cadillac Seville proved that a smaller luxury car could be a smash hit, and it allowed Cadillac to compete with the smaller luxury cars from Europe and win. It was not until the mid 1980s when Cadillac shrunk the size of most of its cars too much, that Mercedes and BMW began taking large chunks of the luxury market share away from Cadillac.